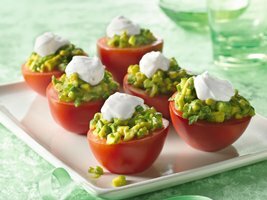 Ruby-red tomato cups hold a guacamole-style filling. Have them ready in 15 minutes! Cut each tomato in half crosswise. Using teaspoon, scoop out seeds and pulp from each tomato half, leaving enough tomato for a firm shell. If necessary, cut small slice from bottom so tomato half stands upright. In medium bowl, mix remaining tomato cup ingredients. In small bowl, mix topping ingredients. Spoon about 1 tablespoon avocado mixture into each tomato shell. Top each with about 1 teaspoon topping.